Remember the iPad event this spring, when the "Resolutionary" display made everyone projectile vomit into each other's mouths and burst into flames, falling wildly into a pit of acid and shame? Good. 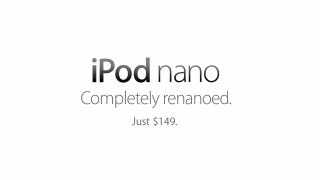 Here's the next step in Apple's hellward ad copy spiral: Renanoed. OK, look. It's a really fun word to say. Renanoed. But like, this doesn't even have the insufferable pompousness of "automagically" or "resolutionary". At least those were puns. This is just dumb. Dumb dumb dumb dumb dumb dumb dumb dumb dumb dumb dumb dumb dumb dumb dumb dumb dumb dumb dumb dumb dumb dumb dumb dumb.